Before heading out on our vacation to Charleston, SC, my mom and I made a concerted effort to eat everything in the fridge that would otherwise go bad while we were gone. This resulted in some packed stir-fries as well as a bowl of rice, beans, and veggies for myself the night before we left. This recipe came out of it, too. I was looking at the massive amount of bell peppers we had left (the product of yet another produce sale!) and wondering what could be done to use them up. 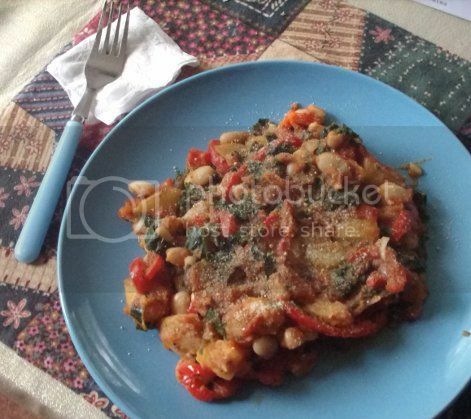 The result was a sort of Italian-esque dish with potatoes instead of pasta. Canellini beans provided a protein boost, while kale gave it a bit of green. You’ll notice that there isn’t any specific measurement for the kale. That’s because kale is awesome, and who am I to put a limit on awesome? Go ahead and use however much you like! 1) Place a vegetable steamer in a medium saucepan over 1 inch of water and steam the potatoes until tender, about 15 minutes, checking the water level occasionally. (Seriously, don’t forget to check. I’ve burned out more than one pan because I got distracted!) Set aside. 2) Heat the oil in a medium skillet or saute pan over medium heat. Add the hot pepper flakes, garlic, onion, and bell pepper, cover and cook until softened, stirring occasionally, about 7 minutes. 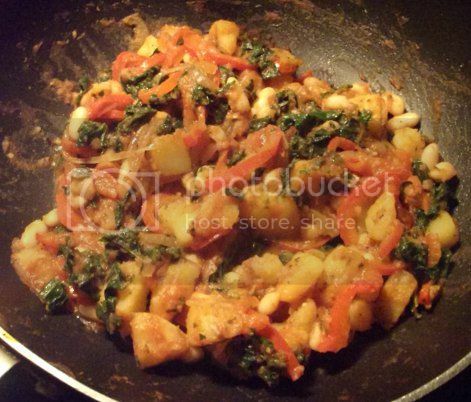 3) Stir in the steamed potatoes. Add the sauce with basil, oregano, thyme, and salt and pepper to taste. Lower the heat, cover, and simmer to blend the flavors, 5-10 minutes. 4) Uncover, add the beans and kale, and cook for 5 minutes more, until the kale is wilted. Taste and adjust seasonings if necessary. Serve with vegan parmesan or some Daiya mozzarella on top!